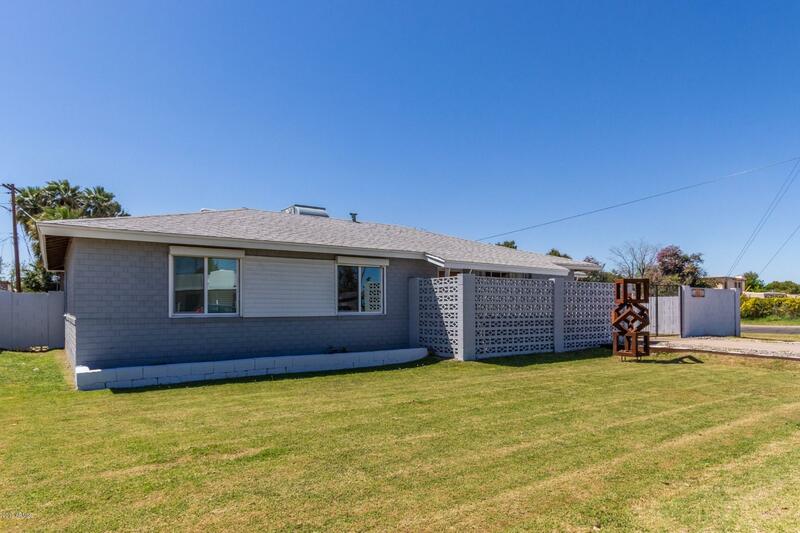 Come and see this 1953 mid century/modern brick charmer with custom features. 4 bedrooms 2 bathrooms with original kitchen cabinets and counters. updated paint, flooring, lighting, dual pane windows and appliances. 3 Phase Air conditioner(energy efficient) replaced 4 years ago with nest thermostat. This corner IRRIGATED 9,893 sf lot has room for pool or large R.V. or boat access. The Detached 1 car garage 20'x16' has side door entrance, water and power. And could be converted to guest quarters/casita and still have covered privately fenced parking. This Arcadia light home is walking distance to the areas boutique bars, restaurants, shopping and entertainment. Just over 1 mile to Arcadia High School, and just under 5 to the heart of Old Town Scottsdale.